Managing data for value is a business-oriented focus on the potential of data. It complements the all-too-common obsession with data’s technical requirements. Data value recognizes that data is a valuable business asset and should be leveraged accordingly. If you are managing data for value, your asset portfolio of data should be protected, grown, and governed. Data’s value should be documented and quantified centrally to provide data intelligence for both business and technical users who work with data. Data intelligence is a combination of data and metadata, plus additional information and functionality, such as lineage tracking, quality metrics, data cataloging, glossaries, and machine learning for the automation of data management. Without data intelligence, the fullest value of data cannot be realized. Data value, data compliance, and data intelligence have an indivisible relationship. This is critical, considering that the European Union’s General Data Protection Regulation (GDPR) will become effective in May 2018. For example, data value provides strong fundamental skills and infrastructure for teams who must achieve data compliance. 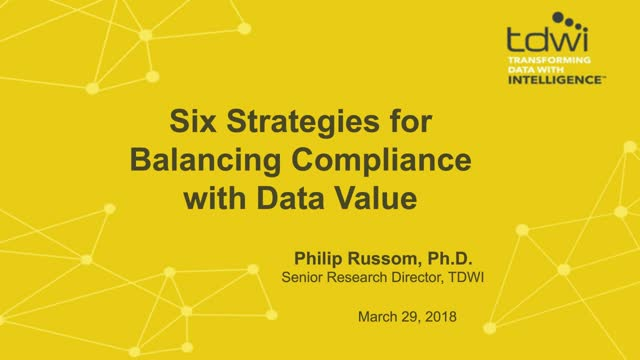 Furthermore, when data intelligence includes governance and sensitivity metrics, it can contribute significantly to achieving data compliance and proving such compliance in an audit.